Price: Depending on where you shop, $14-$22. I won one as a door prize. I won a TI-15 as a door prize (among a Raspberry Pi Zero and HP 49G) on HHC 2016. This is a curious calcualtor, destined for elementary school students. More advanced than a regular four-function calculator yet it isn't a scientific calculator. 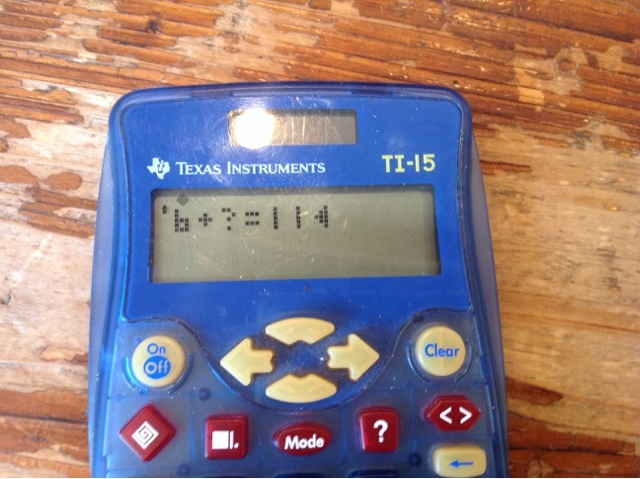 To start, the TI-15 operates algebraically, like most scientific calcualtors. That is, you enter an expression, press [ Enter = ], using the order of operations. The TI-15 also features a power key [ ^ ], a pi key [ π ], and set a fraction keys. Furthermore, pressing [ π ] inserts the π the character instead of its approximation (3.141592653590). Any results in the form of n * π, where n is an integer (like 3 π ) as such. Converting answers to their decimal approximation will require pressing the [ F <-> D ] key. For something really unique, try the [>%] key. It converts decimals to percent form (0.19 to 19%). Fractions are a major feature of the TI-15. Entering fractions require entering the part number and the appropriate button indicate which part to be entered. For example: to enter 3 1/4, press 3 [Unit] 1 [n/] 4 [/d]. The entire two-line screen is used to display fractions. Fractions can be simplified, converted to decimal approximation, and conversions between mixed and improper forms are available. After simplifying the fraction, you can press [Fac] to display the factor used to simplify fractions. For example, enter 105/220. Assume that manual simplification mode is set. 105 [n/] 220 [/d] [ Enter = ]. Press [Simp] [Enter=] to get 21/44. Pressing [Fac] returns 5, meaning a factor of 5 was used to reduce 105/220 to 21/44. 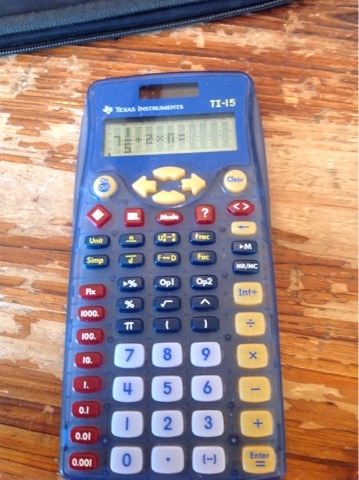 The TI-15 is programming calcualtor. Well, sort of. The two programming keys [Op1] and [Op2] allows for storing a single operation (+, -, *, ÷, Int ÷ , ^) and single number operation. Testing the TI-15, I couldn't get it work beyond this limitation. Results can be rounded to 3 decimal places by pressing [Fix], then , [0.1], [0.01], [0.001] for 0, 1, 2, or 3 places respectively. That is not surprising. However, this might be one of the few calculators (if not only) to a round to tens, hundreds, or thousands mode. The elementary calculator has a quiz mode with three difficulty levels of basic arithmetic. You can also write your own problems, replacing a number or operation with a ?, and try to quiz yourself. The TI-15 is available only online (that I know of). I think it is an interesting and curious calculator to add to the collection, and can be enjoyable for those who want more options but are intimidated or don't desire by scientific calculators. The keyboard is nice and big, I wish the screen was bigger but it is very readable. I wish the basic four-function calculators would consider adding a π and power button to their calculators. If you want a TI-15, shop around. This blog is property of Edward ashore. Nifty! There's some good features. I like the rounding function.